You can anticipate indulging in some world class, fine dining at the St Regis Bora Bora restaurants. Here's information to help you decide whether to buy the meal plan, and if you will get best value from choosing full board or half board. 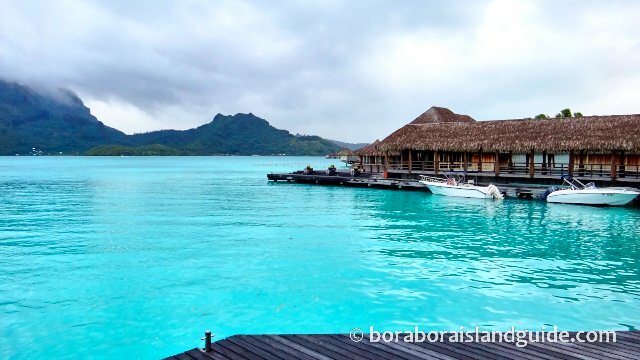 We'll also lead you to some of the most popular places to eat on Bora Bora Island. Set right on the water, with the best possible views of Bora Bora and Majestic Mt Otemanu, this gourmet eating house is one of the most beautiful places in the Resort. It's gleaming golden wood and textured thatched roof, compliments the liquid blue of the lagoon. Lagoon is open from 5pm for drinks and dinner. Arrive early and have a cocktail in the sensational bar. On a clear evening you can watch the sun set over the mountain. If your holiday is at a busy time, make reservations in advance, and ask for an outside table. Eat under the stars, in the balmy air. The world famous Chef Jean-Georges Vongerichten presides over classic French gastronomic dishes and Polynesian delights. Most people say that the food is amazing and the service is top notch. 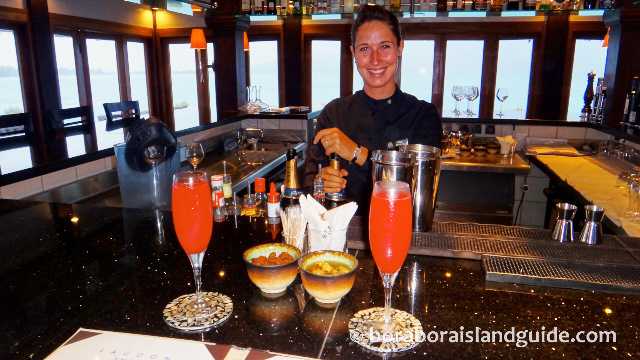 If you're unsure of what to order when dining at the St Regis Bora Bora, ask the restaurant manager for recommendations. The St Regis had the first sushi and saki emporium in Bora Bora. The spherical amber lighting, yellow walls and touches of red and black, transport you back to the cosmopolitan world. If you want 'fresh', it takes advantage of the local fishing catch to serve up classic Japanese favourites with flair. This casual but elegant, on the beach restaurant, has an open kitchen and beach side eating. Starting at 6.30 am, it serves breakfast lunch and dinner, until 11pm. Te Pahu specialises in Polynesian cuisine. I still dream about this delicious tempura tuna! 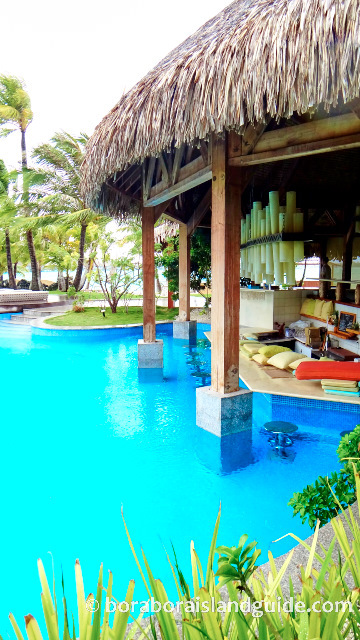 At the main pool on the beach, you can swim up to the bar and relax on an in-the-water stool with an ice cold Hinano beer, Tahitian cocktail or a healthy fresh fruit juice of the day. The bar serves up burgers, club sandwiches and pizzas, all afternoon. In the evening the glistening interior is illuminated by golden cylindrical lighting and there is a marvellous view of the sunset. 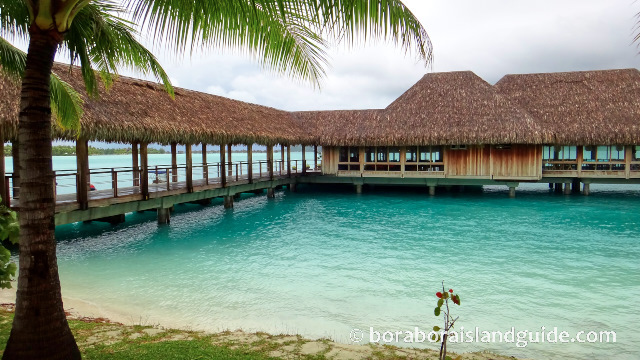 As the St Regis Resort Bora Bora is on a motu, and it's dock is towards the north of the main Island, it will take a little time and planning to get to other food choices. So you will probably eat the majority of your meals at the resort. 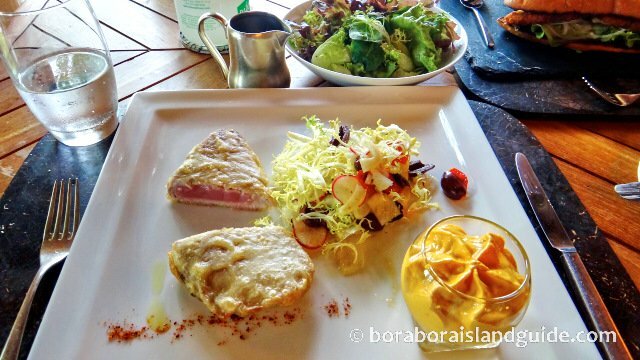 Meals may seem pricey, but it's the same at all good restaurants in Bora Bora. Due to the French influence, 80% of food is imported and wages are high. The breakfast buffet is a gorgeous spread. It's very enjoyable to get up in the morning and linger over this sumptuous breakfast. You'll get your money's worth. 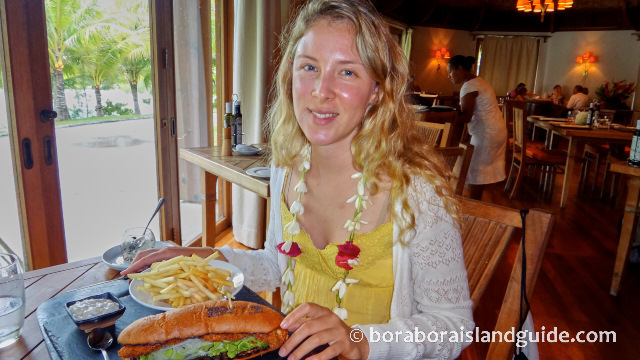 Buy a meal plan before you go, if you are a big eater and will do most of your dining at the St Regis, Bora Bora. This will save money. You can choose full board or half board, which includes breakfast and dinner. Lunch includes two courses, and dinner has three. It's lots of food! So if you are a small eater you will be better off just booking breakfasts and selecting other meals during your stay. A Polynesian feast is on offer for Wednesday night dining at the St Regis. It includes island specialties like a pig roast and fresh sashimi, followed by a rousing Polynesian dance performance. If you're celebrating, you may want to plan an intimate dinner for two, right on the beach. You will enjoy attentive service and the highest quality food. At really busy times of the year, such as August, it doesn't feel quite so special as there may be as many as 8 tables set up. Where else can you eat? If you're staying for a week you may want a change from dining at the St Regis. 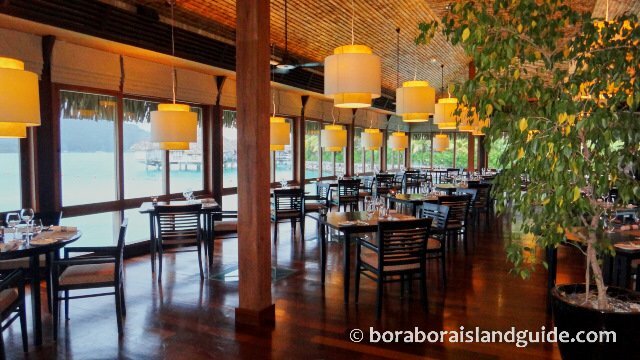 Bora Bora restaurants offer a variety of culinary experiences in interesting settings. Utilise the St Regis shuttle service to get across to the main island and explore more of Bora Bora. The best restaurants provide free shuttle vans that will pick you up and drop you back to the St Regis base. If you're doing day trips there's a wide variety of food choices around the Matira Beach area and several at Vaitape.